The two faces of Marion Jones are inextricably linked. There was the luminous smile she wore on the medals stand in 2000, when Jones won three gold medals and two bronze as the shining track-and-field star of the Sydney Olympics. Then there was the weeping, distraught face on the steps outside a federal courthouse in 2007, when Jones said, "It's with a great amount of shame that I stand before you and tell you that I have betrayed your trust." Years after angrily and arrogantly denying it, she admitted that her Sydney performance was fueled by performance-enhancing drugs and that she lied to federal investigators about it. The mind cannot conjure up an image of the triumphant Marion without also recalling the tainted Marion. From the podium to prison, it was one of the hardest falls in American sports history. "It is truly a Greek tragedy," said Jill Geer, USA Track and Field director of communications. "You might even call it a Greek Olympic tragedy. Hubris definitely played a part. You had the golden child with all the gifts needed to win, and she was brought down by either being around the wrong people or making the wrong decisions." She was one of the last sporting heroes to have her name and accomplishments ruined by the infamous BALCO steroids scandal, and arguably the most popular. Barry Bonds was a bigger star, but not as universally liked. 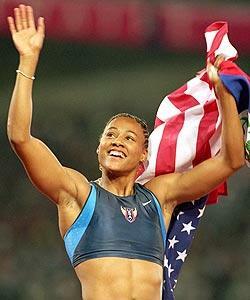 Who didn't adore the smiling, sprinting, leaping Marion Jones? "People loved her," said Geer, who worked closely with Jones in the late 1990s, at Sydney in 2000 and beyond. "Loved her. Housewives, kids, men. I wonder if Marion prevented us from ever loving an athlete like that again." Americans certainly loved the Jones storyline heading into Sydney. She was attempting to win five gold medals, an unprecedented haul in track and field, competing in 100- and 200-meter dashes, the 400 and 1,600 relays, and the long jump. Most analysts believed she had a good chance of winning all five events. Jones also had the rest of the package. In addition to being strong and fast, she was pretty and engaging. Shrewd and calculating behind the scenes, she could turn on the charm in public. Magazines of all genres put her on their covers. TV cameras followed her every move. "She was the Carl Lewis of the Sydney Games," Geer said. "And in track and field, it doesn't get bigger than Carl." Jones was trying for something even Carl couldn't do. Lewis had won four gold medals in Los Angeles in 1984. No track athlete had ever won five. When swimming gave way to track in the second week of the games, Jones was ready to take the spotlight. She was spectacular in the 100-meter dash, winning by two-tenths of a second – a wide margin in a race often decided by hundredths. The lofty pre-Olympics goal took a hit in the long jump when she finished third, but the American public remained keenly interested in her. Jones again won gold in the 200 meters in powerful fashion, and had a gold in the 1,600 relay and a bronze in the 400. A five-medal performance was enough to make Jones the star of Sydney. But it wasn't her only moment in the spotlight. Not long after she won the 100, the International Olympic Committee announced that Jones' husband, American shot-putter C.J. Hunter, had failed no fewer than four pre-Olympic drug tests. Hunter had previously withdrawn from the Olympic competition, citing a knee injury, but was allowed to keep his coaching credentials and attend the games. The IOC stepped in to strip Hunter of those credentials. Jones sat stoically at a press conference in Sydney while Hunter defended himself. Also present at the press conference: BALCO founder Victor Conte, who argued that Hunter had taken a tainted supplement. "Sydney marked the height of her visibility and fame," Geer said. "But it also marked the start of the issues that would be her fall and her undoing." As BALCO blew up in the early part of the 21st century, it ensnared several people in Jones' life – yet she continued to maintain her innocence. But in 2004, Conte told ABC News that he personally gave Jones performance-enhancing drugs before, during and after the Sydney Olympics. Hunter, by then her ex-husband, testified that he had seen Jones inject herself with PEDs. Jones eventually was charged with perjury for lying to two grand juries investigating BALCO, and was also charged for her involvement in a check-fraud scheme. With the evidence weighing heavily against her, Jones made her tearful admission on the courthouse steps on Oct. 5, 2007. "I have let my country down and I have let myself down," she said, while maintaining that she did not know she was taking steroids at the time they were given to her. "Only Marion knows the truth about her drug use," Geer said. "There were feelings of disappointment and betrayal on a number of fronts, for a lot of people. It's hard not to feel sorry for her as she's crying on the steps of the courthouse, but for people who saw her lie so angrily and vehemently, for people in the sport, that was tough." The self-inflicted damage extended well beyond her reputation. Jones also was stripped of her Olympic medals and was sentenced to six months in prison. Upon reporting to Carswell prison facility in Fort Worth, Texas, in March 2008, the one-time queen of American track became Prisoner No. 84868-054. While Jones was incarcerated, the Beijing Games took place. The U.S. track and field delegation had no one trying to win five Olympic gold medals – but neither did it have anyone accused of defrauding the sport and the American public. "She symbolizes where the sport has come from, and now serves as a lesson for where we can go," Geer said. "She serves as a deterrent. Your entire legacy and finances can be wiped out. Marion will always be a huge part of the sport's history, good or bad."